Subcompact crossovers have found their place on Philippine roads. They’re supposed to be the perfect fit for urban motorists – good ride height to deal with ruts and the occasional floods, small enough to maneuver and park, and a price of around or even less than PhP 1 million that makes it accessible compared to mid-sized SUVs. The Ford Ecosport made a killing being among the first ones to market but the segment is now getting more crowded with the arrival of the Nissan Juke, arguably the Kia Soul, and, our unit in focus, the Honda BR-V. Soon, we’d expect to see more of the Mitsubishi Expander (though some consider this an MPV), the Chevrolet Trax, the Hyundai Creta, and the Mazda CX-3. We finally got to test drive the Honda BR-V, a good while after the buzz has died down. For those in the market for a new vehicle, sub-CUVs are pretty much a must-consider. Here’s ourtake on Honda’s offering for the segment. Powering the BR-V (both the base S and the R Navi) is a 1.5L i-VTEC gasoline engine that produces a nifty 120 horsepower. Too bad, we don’t get the diesel option that’s available in other markets. It wouldn’t been nice for better torque and cheaper fuel. Now the power might not sound much since the BR-V supposedly seats 7 but the car can actually lug that much around. It should be a given that you shouldn’t expect much in terms of acceleration and speed from the power train if you are carrying that much load. However, it can do a decent job hauling that many people up the inclines of the likes of Tagaytay or Antipolo roads. The engine is mated to a 5-speed CVT which gives the BR-V a smoother ride since you won’t feel the slight shift jerk from a standard automatic. Some may frown upon the lack of traditional but most new cars do come with CVT these days. CVTs get a bad rep for being too complicated and costly to run and repair down the road. Modern CVTs have supposedly addressed this issue. Despite being called by Honda as a small SUV, the BR-V drives like a car. It’s just 20mm longer (that’s just about a width of a thumb) than the Honda City. The electronic power steering system feels light making it easy to chuck it around a bit. Despite its height, it still feels planted going around corners at some speed. Expect understeer though. Safety features such as hill assist (a system that prevents you from rolling down when starting from a full stop on an incline) and stability control are available even in the base model. Driver and front passenger airbags also come standard. 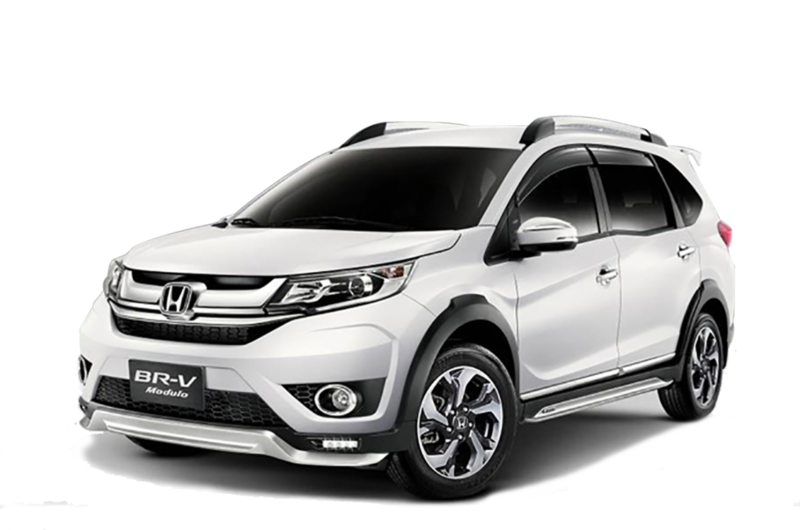 The BR-V holds a 5-star ASEAN NCAP rating. The BR-V has a ground clearance of 201 mm which should allow it to navigate most urban obstacles like badly-designed parking structures where ordinary sedans and subcompacts could scrape the undersides of their bumpers. Unfortunately, no wading depth is published so err on the safe side and only ford up to half-knee-deep floods. Some might think that the BR-V tries too hard to look tough as an SUV. It does, at some angles, look like a beefier and gayot Toyota Avanza due to its slim width, taller ride height, angled fender lines, and roof rails. However, it does seem to be the safer bet looks-wise compared. It does look a bit more modern than the Ecosport and more conventional than the quirky Juke. Those visiting the casa and seeing the BR-V side by side with the new face-lifted Mobilio might have a second take. The new Mobilio does seem a bit sportier. For some reason, color matters too. Their golden brown metallic is an acquired taste and their silvers and titanium look slightly bland. It would definitely boil down to preference but the combination of the base Taffeta white with the black body bits somehow looks better than the other colors. Their range-topping pearl white color exclusively for the R Navi variant is a visual treat but has a PhP 20,000 premium. Chrome bits on the door handles and bumpers readily differentiates the R Navi variant from the base S. As an option, buyers can go for the Modulo body kit which adds some more flare to the bumpers, step guards, and a rear spoiler though we feel that the kit just makes the BR-V look more of a try hard with all the kits. Creature comforts for the BR-V are quite standard. If there’s a knock against the BR-V is how plasticky it is. There’s not really much of an upgrade from the Brio since it does share many from its parts bin. The seats aren’t exactly luxurious or comfortable. Perhaps that’s the trade off for space but that I don’t buy. The City has a much nicer interior to live with. You may consider opting for the R Navi for its leather seats. Unfortunately for drivers on the shorter side, there’s also no seat height adjustment or even lumbar support. I remember my old 93 Corolla had those. The aircon unit cools the car nicely. Like bigger SUVs the middle row gets its own aircon fan control and vents so if you have more passengers, cool air would be able to reach them. It even has a “Max Cool” button that sets the system to go full blast best for Philippine summers. Accessory-wise the S gets a Bluetooth capable head unit while the R Navi gets a swankier navigation-enabled one. Amazingly, there are phone recesses for the middle and rear seats though they only fit smaller iPhones. Parking and rear cameras come as options. Too bad they are priced at such a high premium from the casa. Honda warns that fitting aftermarket electronics that require splicing and boring will void your electrical system’s warranty. The BR-V’s best bit is perhaps its cargo space. When the rear seats are folded, the cargo space swells from 223 liters to 691 which is even more than what the bigger CR-V has to offer. We were able to comfortably fit around 8 fully-loaded gym bags without even covering the driver’s view through the rear window. There are certain things that some might find off or quirky with the BR-V. Perhaps, it’s due to a heavy-ish right foot but the car seems to like to rev up from standstill as if to get the car quickly into second gear. There’s also no active temperature gauge. The manual says the dash temperature indicator will just light up if the heat rises above its normal operating temperature. When starting the engine, you’d also notice the engine revving to 1,200 RPM before settling below 1,000 after a minute or so. There’s only one 12V port (with no cigarette lighter) so you may have to purchase additional ports or charger if you plan to add phone chargers or a dashboard camera. There’s no armrest and center console for both models. Without the Modulo body kit, you also don’t get mud guards and step board though these can all be fitted aftermarket. Tip: You can these bits cheaper from your friendly neighborhood Banawe or OLX accessories seller. We do suggest getting at least a parking sensor from the casa just to protect your warranty. The base model S sells for PhP 998,000 while the R Navi sells for PhP 1.128 million. Honestly, I couldn’t justify the price difference between the S and R Navi. You do get the chrome and leather bits and swankier navigation and entertainment system. A smartphone with Waze is often a better solution than most built-in navigation systems these days. You can also buy and install aftermarket leather bits on the cheap. We just feel that the R Navi price is a tad high. Spending more than PhP 1.1 might trigger some to reconsider other options such as a real mid-size SUV, the new diesel Innova or even the HR-V. The practical people in us would spring for the base S model. While the Ecosport and Juke are cheaper, you do get more seating and cargo space with the BR-V. If all you’re after is the ride height and not the space, then you could consider buying a sub-CUV and another subcompact like a Honda Brio or a Toyota Wigo for the price difference between a mid-spec SUV. Based on our drive, the BR-V’s gas engine does around 6-7 km/l for traffic city driving . Honda also requires buyers to have it serviced every 5,000 km or 6 mos. whichever comes first to keep its 3-year warranty. We’re in the belief of paying a bit of a premium for casa maintenance just for the warranty especially with all the expensive electronic parts of cars these days. All in all, the BR-V is a good car perhaps the most practical in the segment yet given a choice among that, the Ecosport, and the Juke. It’s a great car as a daily driver and good enough for a small family of 4-5 people. The perfect use case would probably be a load of 4 adults (so there’d be plenty of space) and plenty of cargo space at the rear. The cargo space would be enough to store groceries and luggage for those weekend staycations and nearby getaways. The price point isn’t bad either.